I was contemplating whether to put this recipe online because I don’t always like using spiced packages or mixes which I did not make myself. However, my mom came to visit and brought a Paneer Chilli & Spice mix packet along with some paneer and made us her version of Kati Rolls. Kati Rolls originated Kolkata, India. Traditionally, it consists of a Katikabob enclosed in a paratha (indian tortilla). But today, pretty much any filling rolled up in any kid of indian flatbread is called a Kati Roll. When I looked at the spice mix she had brought, it contained corn starch, soya sauce, garlic, sugar, chilli, salt, tomatoe powder, lemon powder, black pepper, and ginger….and THAT’S IT. So… when she offered to leave a few more of the spice packets for me, I decided it wouldn’t be horrible if I used them for a quick meal again since her Kati Rolls tasted great!! A week ago, I made this dish again, except for this time, I made two versions. One using Paneer for my husband who loves paneer, and one for myself using Tofu. The Tofu version tasted great as well…and it was a much healthier option. In addition, I’m not a huge fan of Paneer. The only reason I had some in my fridge was because my mom brought it for me. I usually end up picking it out of my indian dishes when we eat out, so using Tofu was a great alternative. Next time, I’m going to try and make this dish from scratch using similar ingredients that were listed in the spice packet to try and re-create the flavors. For the gluten-free option, you can have your favorite gluten-free tortilla or simply eat it with some rice. The obvious vegan option is to use tofu instead of paneer. * Use your favorite dry paneer chilli spice mix. The one I usually use is “Rasoi Magic” and can probably be found at your local indian grocery store. ** I’ve had this dish with fresh paratha, flour tortilla, and naan, all of which taste good. I did not write the recipe down for the fresh paratha, but the next time I make some I will update my blog with the recipe. For the Naan, I usually buy the frozen ones from Trader Joe’s. If Using Paneer: Cut the paneer into 1/2 to 1 in. 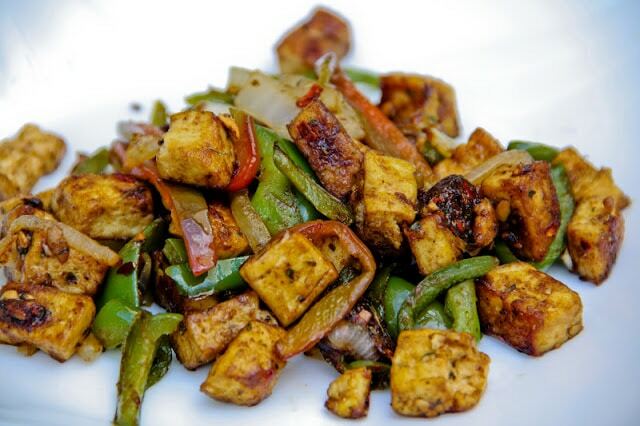 cubes and pan fry on medium-high heat with 1-2 T olive oil, mixing and turning frequently until the paneer is lightly golden brown on most sides (be sure not to burn the paneer). If Using Tofu: Cut both tofu blocks in half. Place each half in a clean paper towel one at a time and squeeze to remove excess storage liquid (without breaking up the tofu). Cut the tofu into 1/2 to 1 in. cubes and pan fry on medium-high heat with 1-2 T olive oil, mixing and turning frequently until all the water is burned off and the tofu is lightly golden brown on most sides (be sure not to burn the tofu). 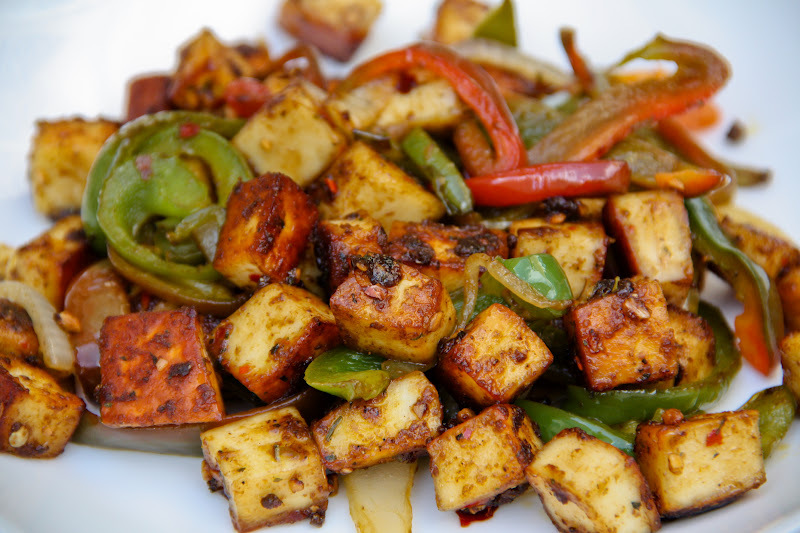 To Prepare the Dish: Add the sliced peppers and onions to the dish and saute with the tofu or paneer until tender on medium heat. If you feel like the contents of the skillet are sticking to the pan, add some more olive oil. On low-medium heat, add the dry spice mix and salt to taste. Continue to mix until all the spices are combined. Roll the resulting dish in some fresh paratha or cooked tortilla and eat like a burrito. Or eat on the side with some Naan and/or cooked rice. I make this dish all the time! I pretty much have all the ingredients for this in my fridge and pantry all the time. It's quick, easy and filling. I highly recommend this recipe. The spice mix that is recommended is super flavorful!